Magnets are commonly used for encoding information in a wide range of devices. This may include buried magnets in shafts to detect the speed and position of a gear. Other magnetic devices are used to store numbers or text by encoding a magnetic material with a magnetization pattern. AMPERES (3D) and MAGNETO (2D/RS) are ideally suited for this task. Commands are available to first place the magnets in a magnetizing fixture. 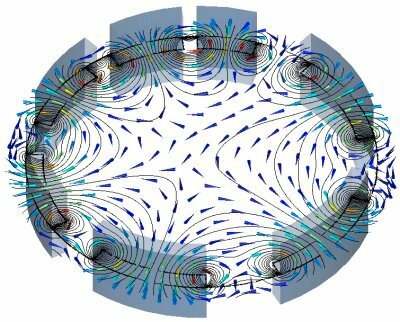 The magnets can then be taken out of the fixture and placed in the design to calculate the magnetic field pattern. This powerful feature enables the complete design of a magnetic encoding system.